A quick way to generate more site visitors to the programs you own, or to get signups to programs you promote, this fully featured rating script easily attracts new members to signup. 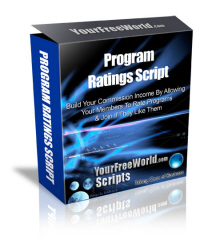 Many people who carry out their due diligence online like to see ratings and reviews of programs before they join, and this script allows your members to view and rate each program depending on their own experiences. Even though it's a free service, you can still generate income from the top and bottom sponsor advertisements, and through Paid Feature Program listings. With a built-in affiliate program, your members will become your instant sales force promoting your site for you. Thehighly customizable, fully functional admin area makes it easy to manage each facet of your business, and you can email members with a first alert newsletter to advise them of new programs available for rating. This script also offers a listing of the top rated programs plus external program submission from webmasters. It is certainly a worthwhile script for anyone who wants to build a list of subscribers, or build up the membership base of their own programs, and to generate more affiliate commissions in external programs. Easy management with full instructions provided. Advertising feature to sell top and bottom sponsor banner ads. Members can Rate and Comment on Programs. Members can submit their programs for rating and review comments. Visitors can view the ratings, read comments, and join the programs. 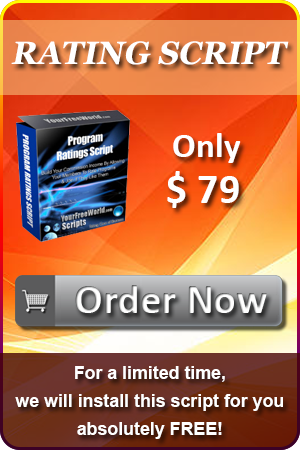 Automatic sorting of programs into Featured Program, Top Rated Program and Latest Programs listings. Members can upgrade their listing to a Featured Program for a fee. Members can earn affiliate commissions when their referrals upgrade their listing to a Featured Program. Ability to include 4 popular merchant accounts to accept payments through, plus facility to add up to 5 more merchants of your choice. Set sponsor's commission for referral's Featured Listing. Set frequency of commission payment to each renewal or one-time only. Ability to show or hide extra fields from signup form. Choose to have email confirmation on signup. Allow or deny member program submissions. Choose the number of programs members can submit. Customize system emails, web pages and bonus downloads. Mail Members including 8 personalisation tags. View Completed Withdrawls & Pending Withdrawls. Carry out Mass Pay function. View pending top and bottom sponsor banners, and approve or delete. Add/Edit/Remove Promotional Banners & Promotional Solo Ads. Add your affiliate link to Powered By YourFreeWorld Scripts link in footer.